This curious and long-established surname is of Old French origin, and is an interesting example of that sizeable group of early European surnames that were gradually created from the habitual use of nicknames. These nicknames were originally given with reference to occupations, and to a variety of personal characteristics including: physical attributes or peculiarities, mental and moral qualities, and habits of dress and behaviour. The derivation, in this instance, is from the Old French and Middle English "hasard", game of chance, used to denote an inveterate gambler, or foolhardy man prepared to undertake risky enterprises. The surname first appears on record in the latter part of the 12th Century (below), and further early examples include: Geoffrey Hasard, noted in the 1185 Knights Templars' Records of Lincolnshire, and Walter Hassard (Kent, 1197). In the modern idiom the name is variously spelt: Haz(z)ard, Has(s)ard, Haszard and Assard. 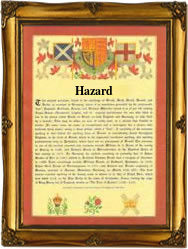 On May 2nd 1585, Robarte Hazard and Anne Holmes were married at St. Vedast, Foster Lane, London, and on July 12th 1693, Pierre Hazard married Marie Drouin at Moivrons, Meurthe-et-Moselle, France. John Hazard, an early settler in the New World, was recorded on a "List of the Living at Elizabeth Cittie, Virginia", on February 16th 1623. A Coat of Arms granted to the Hazard family depicts a golden garb on an azure shield, the Crest being a dove holding in the beak an olive branch, all proper, on the top of an anchor in the sea. The first recorded spelling of the family name is shown to be that of Hugo Hasard, which was dated 1170, in the "Pipe Rolls of Hampshire", during the reign of King Henry 11, known as "The Builder of Churches", 1154 - 1189. Surnames became necessary when governments introduced personal taxation. In England this was known as Poll Tax. Throughout the centuries, surnames in every country have continued to "develop" often leading to astonishing variants of the original spelling.